There’s not much that’s more frustrating than shelling out on good quality shoes for your little one only to discover that they have managed to kick them out of the pram somewhere between your house and the park. You need a pre-walker shoe that will stay on. Adelaide native Pia Nowland knows a little something about pre-walkers. They wriggle. Following a few years of making shoes at home on her trusty industrial sewing machine, and then an intensive shoe design course in Italy, Pia’s new brand Lapito was born. Each pair of pre-walkers in the Lapito range is handmade from high quality one hundred percent leather, but it’s the little touches that will have you sold. They’re easy to get on and off, and the leather is baby soft. The sole is padded for extra comfort, and the little heel strap makes it just that bit easier to get the shoe on your squirmy baby’s foot. 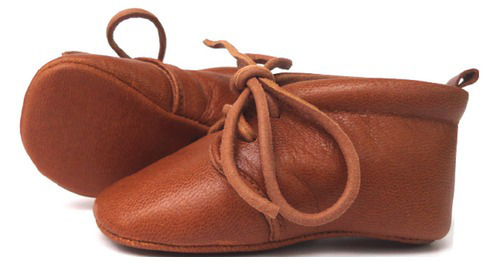 The padding around the ankle and the leather laces keep them firmly in place. There are currently seven designs in the range, and they are $60 each. You can pick them up directly from Lapito.